"...allows apartment renters to visualize where Boston’s most and least expensive apartments are. 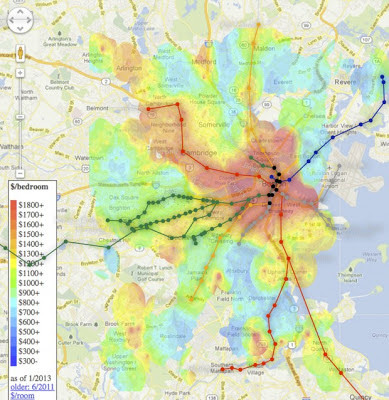 Kaufman’s heat map displays the cost per bedroom relative to each Boston neighborhood. The map indicates the most expensive apartments in Boston tend to hover between Back Bay and Downtown Boston and on into the Seaport District. The region’s least expensive apartments are found near Mattapan, Dorchester and Revere. Areas of Cambridge along the Red Line also display expensive apartment listings, where the booming tech economy is squeezing commercial rents for startups."